Sorry for disappearing suddenly, was not keeping well for a while.. 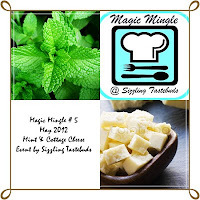 I'm trying to complete my entry for the Magic Mingle #5 hosted by Kalyani, using Cottage Cheese and Mint as the main ingredients. Ever since Kalyani had announced the theme I had wanted to make the Masala paneer as my kid loves it. While living in Delhi, I would make it a point to buy masala paneer from Gopala. His paneer was extremely soft, flavorful and I used to use it for making sandwiches and tikkas. Ever since I've moved to my current city, I tend to make Cottage Cheese at home, which turns out much better than available outside, which is quite chewy.For a change instead of making the regular cottage cheese I made the Gopala version of Masala Paneer which turned out very tasty. This paneer is not only flavorful but has greens in it, which makes it healthy too. I have used toned milk to make a low fat cottage cheese as I'm on a strict diet regime, but one is free to make use of full fat milk for a creamier cottage cheese. Slowly add the diluted lemon juice and let the milk curdle. Diluting the lemon juice, ensure even spreading and curdling. Remove the whey and collect the cottage cheese in a sieve. Transfer into a cottage cheese mould. Cover with a lid and put weight on it. Let it stand for half an hour. Un-mould and cut into cubes. Unfortunately, the Cookbook sent to Fathima was returned back by the courier company saying the address was incorrect, so I've picked another winner by random method which is No. 70, Urad dal laddoos by Hema of Aromatic Cooking. Hema, congrats, please mail me wihin two days, your correct address in India with a proper landmark, pincode and cell number to cookingoodfood@gmail.com, to ensure that the book gets delivered in time. Hi I hope you're feeling better now.....the masala paneer is very nice. ahh such a great thing to do. how do you use this? put in curries or just eat on its own with salt and pepper? would make lovely party starter with salty biscuits. definitely gonna make this. btw what is paneer mold? where can we get that? I've already provided various options of using the paneer in the post, but you can try your own variations. A paneer mould is use for setting the cottage cheese, it comes with a box with two movable discs, one at the base and one on top, it's available in good steel utensil stores. Btw, where do you get your zaatar from? Nice recipe. Paneer in any form is tasty! MASALA PANEER LUKS SO YUMM...MOUTHWATERING !! Delicious and so creative..looks so delicious and beautiful..
O sorry you are feeling bad. Please get weell soon. Wow this is delicious. Love the paneer. What is this paneer mould? Can you post a pic of this? Yumm!! I make this kind of spicy cottage cheese at ome too! Delicious. Super flavourful and very unique paneer cubes. Tastes delicious n really feels appetizing!! tats an awesome paneer prep, would love to try it sometime soon..
wow simply superb... i just love this post!